Ian tries hard to avoid the young lass who's confounded him for years. But now that they're attending court, he must keep watch on her night and day. Danger is at every turn and advisors to the Crown are being murdered. Ian soon realizes the girl he's been protecting is a beautiful lady who needs his help, almost as much as he needs her. 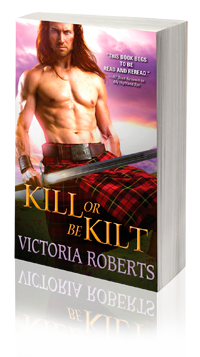 "I adore this series, and as usual, Victoria Roberts has written another well crafted book with brilliant characters..."
“ʼTis good to see ye, Fagan.” Ian gazed around the courtyard, breathing a sigh of relief no Walsinghams were in sight. “Tha gu math.” I am fine. Ian embraced the man who was like a brother to him. “ʼTis good to see ye, Ruairi.” Without warning, a hand clasped Ian’s shoulder from behind, and he turned. Ian shook his head as if he’d consumed too much ale. He couldn’t believe so much had changed. The last time he’d seen the girl she was only nine. Ruairi’s wife approached them, and her wealth of red hair dangled in loose tendrils that soft­ened her face. She’d always looked elegant and graceful, and Ian was glad to see some things hadn’t changed. A growl escaped him. “Something in my gut told me that I should’ve just met all of ye in London.” His mouth pulled into a sour grin, and Ruairi waved him off. A young woman stepped in front of the dais and cleared her throat. She had reddish-brown hair that hung in loose waves down her back. Her figure was slender and regal, and Ian could’ve easily drowned in her emerald eyes. But what captured his attention the most was the way the lass carried herself—confident, yet seemingly unaware of her true beauty. She wore a black gown with hanging sleeves, and the embroidered petticoat under her skirts was lined in gray. With the added reticella laced collar and cuffs dyed with yellow starch, she looked as though she should’ve been at the English court rather than in the Scottish Highlands.